When Space Shuttle Atlantis launches from Kennedy Space Center, it won’t just be the 135th and final mission of the Space Shuttle fleet—it’ll be the first space mission for Apple’s iPhone 4. The presence of two iPhone 4 models, bound for experiments on the International Space Station (ISS), is due in large part to Odyssey Space Research, a company that’s been in the space business for two decades, and Nanoracks, a company that provides hardware for the U.S. National Laboratory portion of the ISS. It’s a part of a larger push to increase the participation of lower-cost, mass-produced commercial products in space missions. According to Odyssey Space Research CEO Brian Rishikof, last summer’s announcement that the iPhone 4 would include a built-in gyroscope is what set this chain of events in motion. “For the technological domain in which our company works, that [gyro] made a big difference,” Rishikof said. On the space station, astronauts will use the iPhone’s gyro, accelerometer, and cameras to collect data related to navigation and radiation tracking. “It’s really, truly an experiment,” Rishikof said. After the iPhones are returned to Earth (most likely by a Russian Soyuz capsule next fall), much of the data will be viewable on the SpaceLab for iOS app. Getting the iPhone 4 qualified for use in space was not an easy project. The iPhone 4s that will fly on Atlantis aren’t jailbroken and they haven’t been hardened for use in space. In order to speed certification, Rishikof said that the company made some minor modifications: all wireless communication has been disabled (sadly, there's no Spaceship Mode setting) and the battery has been removed. Instead, an external battery pack already certified for use in space will be used. 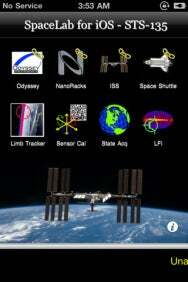 This isn’t to say that an unmodified iPhone 4 couldn’t work in space. In fact, Rishikof said he was “hopeful” that the whole device could be certified by NASA—but certainly not fast enough to catch a ride on the final Shuttle mission, currently scheduled for lift-off this Friday at 11:26 a.m. ET. “Certifying a new battery for use on orbit is potentially expensive and challenging… by all accounts, it looks like we could get there,” Rishikof said, but it would’ve just taken too long. What would it cost for a contractor to purpose-build a smartphone from the ground up for use in space? “I can’t even imagine,” Rishikof said. “There are 200 million iOS devices in circulation, and a ton of developers. Imagine unleashing all that creativity” on different space applications. Though the project uses Apple hardware, it’s not an official Apple project. That said, the company did provide Odyssey with technical answers about the function of the iPhone 4 that helped expedite getting the device approved for the ISS. “It’s gonna be interesting,” Rishikof said.